Okay, so I'm down to the wire for prepping for this baby! My little boys went to grandma's for 48 hours, so I was on the prepping rampage and that started with freezer meal preps! 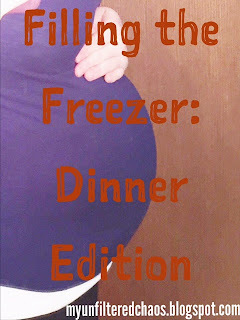 When I had Layne I made a bunch of freezer meals, but didn't try them out ahead of time. Most of them sucked, and I was mad I had wasted my time and money. Since then, I've been trying a variety of recipes ahead of time, and have found what has been the easiest and tastiest. I was going to do breakfast, snacks and dinners all together, but it got really long. So look for a breakfast and snack edition in the next couple days! I was a teacher before staying at home, so I've learned that recreating the wheel is exhausting! So some of these recipes I got from a variety of other people and put my own twist on, and some are all mine. Let me preface this with saying that I have to make sure that I have enough food for 3 hungry boys and my husband, plus myself, (and MAYBE leftovers for a lunch) so feel free to downsize the portions to what would work for you! Also, there are probably healthier and more complicated ways of making sauces and spices, but my goal in this whole thing was for it to be easy! I'm busy, so time is precious! Finally, we buy ½ a cow and ½ a hog every fall, PLUS we hunt deer, so the only meat I ever have to buy is chicken. No we are not friends of PETA, but we save a lot of money by doing this, so that is why you see funny packaging for our meat! Please Pin the hell out any of the recipes that you want! I officially feel prepared (minus my hair and nails being done) for this baby! Also, there are some helpful tips at the bottom of this post! Be sure to check them out! 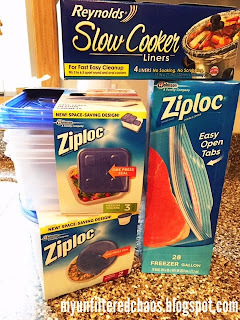 -Clean out your freezer! Trash old, freezer burnt stuff and organize it so that you know what you have in there! -Labels! If you feel like you need to be crafty for your freezer, feel free to! I used my son's construction paper, packing tape and a sharpie! But be sure you label them some how! -Get freezer storage items (freezer Ziploc bags, plastic containers, aluminum pans and aluminum foil) and slow cooker liners! I'm a heavy slow cooker user normally, and had never used a liner before. Needless to say, my mind was BLOWN! Directions: Brown your meat. Sprinkle with some minced onion and garlic. Drain. Add taco seasoning while following the directions on the package. Once the mixture is cooled, place in freezer container, label and freeze. To reheat: Thaw in container in the fridge overnight or on the counter during the day. Put meat in skillet and heat on low/medium heat until warm throughout. Serve on tortillas with your choice of toppings. ***The Ziploc brand medium square container will hold this quantity perfectly! Directions: Label your freezer bag with cooking instructions. Put everything into a freezer bag and mix around. Lay flat to freeze. To cook: Thaw bag of ingredients overnight in fridge. Place in slow cooker (use a liner for easy cleanup!). Cook on low for 7-10 hours. Keep meat in cooker and shred with 2 forks. Let meat sit for 10-15 minutes in sauce before putting on buns and serving. Directions: Brown your meat. Sprinkle with some minced onion and garlic. Drain. Add both jars of sauce and then transfer to freezer container. To reheat: Let sauce thaw in the fridge overnight or on the counter during the day. Pour sauce into saucepan on stove and heat on low/medium heat until warm throughout. ***The Ziploc brand large round containers holds the entire batch of sauce. Directions: Mix all ingredients together in a large bowl. Spray some cooking spray into an aluminum pan. Spread mixture evenly into the bottom of the pan. Sprinkle with ½ cup of brown sugar. Cover with aluminum foil, label and freeze. To cook: Thaw pan in fridge overnight. Preheat over at 375 degrees. Spread an even layer of ketchup over the top of the meatloaf. (Yes, over the brown sugar, trust me!) Bake for 45 minutes or until the center of the meatloaf is no longer pink. Directions: Heat cream cheese in a microwave safe bowl until very soft/melted. Add cream cheese to shredded chicken and mix thoroughly. Add both cans of green chilies and 1 can of enchilada sauce, then combine throughout. Spray aluminum plan with cooking spray. Assemble enchiladas by adding filling to the tortillas and then tightly rolling. This recipe will make 8-12 enchiladas, depending on how full they are filled. Place additional can of sauce into a Ziploc bag to be used at time of use, along with the shredded cheese. Cover, label and freeze. To cook: Thaw pan in fridge overnight. Preheat oven at 375 degrees. Pour bagged sauce over the enchiladas and top with the cheese. Bake for 30-45 minutes or until heated throughout and cheese is bubbly. Directions: Cook ground meat with a sprinkle of minced onion and garlic. Drain. Return meat to pan and mix in both cans of cream of mushroom soup. Spray the aluminum pan with cooking spray. Spread the meat mixture on the bottom of the pan. Layer the cheese over the meat and then place tator tots on top as the final layer. (If you put the tator tops on the meat and the cheese on top of them, they will not get crispy when cooked.) Cover, label and freeze. To cook: Thaw in fridge overnight. Preheat oven to 400 degrees. Cooke uncovered for 45 minutes or until warm throughout and tator tots are crispy. Directions: Label freezer bag with cooking instructions. Add all ingredients to the freezer bag and seal. Lay flat to freeze. To cook: Thaw in fridge overnight. Place in slow cooker on low for 5-6 hours. Shred chicken and stir. Let sit on warm for 10 minutes before serving. Directions: Cook spaghetti noodles according to the package. Sauté onion in butter. Add soups, mushrooms, garlic salt, and 1 1/2 cups chicken broth. Spray aluminum pan with cooking spray. Add spaghetti & chicken to the bottom of the pan, pour soup mixture on top. Cover with shredded cheese. To cook: Thaw in fridge overnight. Preheat oven to 350 degrees. Bake for 20-30 minutes, or until cheese is melted. Directions: Spray aluminum pan with cooking spray. In a bowl mix all ingredients EXCEPT chicken together. Pour mixture into pan. Put chicken on top of the rice mixture. Cover, label and freeze. To cook: Thaw in fridge overnight. Preheat oven to 350 degrees. Bake uncovered for 50-60 minutes or until chicken is cooked throughout. Directions: Spray aluminum pan with cooking spray. Mix cottage cheese, Parmesan cheese, 1 bag of shredded cheese, parsley and garlic salt together in a bowl. Spread a layer of marinara on the bottom of the pan, followed by a layer of noodles and cheese. Repeat this order until pan is full. Be sure to end on noodles with sauce over it. 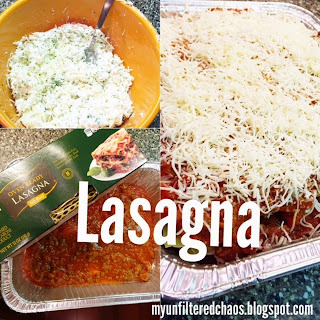 Cover the lasagna with the last bag of cheese (about a cup or so). Cover, label and freeze. To cook: Thaw in fridge overnight. Preheat oven to 350 degrees. Bake for 45-55 minutes, or until everything is bubbly and warm. Anything that you make that calls for cooked chicken/shredded chicken- put the raw chicken in the slow cooker with a couple cups of chicken broth for 5-6 hours. I put 2 recipes worth in in the morning, ran errands, and when I came back they were ready to go! Make a grocery list. I made all of these over 2 days (not full days by any means!). The first day I made everything that I could with what I had on hand, which is great since I had canned items that needed used! After day one I made a list of everything else I needed. In hindsight, I wish I made a list of EVERYTHING, crossed off what I had already and then went to the store and got the rest. If I had done that I would have knocked everything out in a couple hours. Do your dishes as you go. If you don't, you will end up with no bowls to use or spoons to stir with! Look for Filling the Freezer: Breakfast and Snack Edition coming soon!!! Great idea! I did not do this before either of our boys arriving, but I've been thinking I definitely need to do this before the twins arrive this fall! Already have the freezers all cleaned out, defrosted, and organized (due to one of them quitting on us last weekend), so they are all ready to be filled up with meals. :) Definitely pinning this for use later this summer! Thanks! And good luck with Jayce's arrival!!! I used the half steam tray aluminum pans from Sam's Club (not sure of the size), but everything would work in a 9x13.